Delicious orange mango sangria with sweet red wine infused with mango, orange, lemon, and lime, then spiked with a surprise shot of orange cointreau. My mother is visiting this week and we got to (drumroll please) enjoy a whole pitcher of mango sangria together! Which, clearly, I’m very excited about, and I’ll tell you why: it’s one of the joys of growing older while my mother is still in my life. Because the older I get, the more I learn about new foods, which I can then share with her. 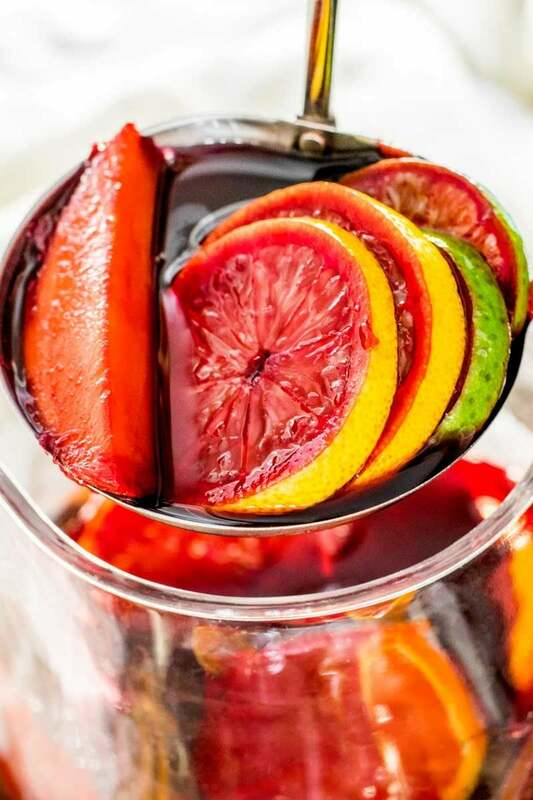 Like, say, an easy red wine sangria recipe! So, as I said, my mother is here enjoying all the beautiful Phoenix weather with us, and with her arrival came our belated Christmas presents. Most of my presents were a surprise, consisting of clothes and some awesome Star Wars jewelry, but I already knew what she got for The Husband: Sangria Recipes by Lisa Shea. And being the person that I am, I had no problem taking his presents and trying out a random sangria recipe. And really, what better way to pay my mother back for such thoughtful gifts than to get her drunk make a delicious drink she can enjoy on the patio? A mango sangria recipe that’s spiked with orange cointreau. There was just something about the combination of mango and orange that already had me reaching for my car keys so we could go buy some fresh fruit. Between the two of us, The Husband is the sangria connoisseur. Whenever we go to a restaurant that serves it, he almost always orders a glass, and he grades them all against the sangria we get at our favorite mom-n-pop Italian restaurant. And I’ve gotta admit, they do have some amazing sangria, filled with all the best fruits – strawberries, raspberries, blueberries, blackberries, etc etc… but at the same time, that’s the same fruit that all the restaurants put in their sangria. It’s very rare to find a red wine sangria that doesn’t pile on the standard red and blue fruits. I guess that’s why this particular sweet red sangria recipe jumped out at me, since I adore mango and orange and had yet to ever see mango sangria. Plus, any red sangria recipe with brandy gets a thumbs up in my book! The flavor combo was too interesting to ignore. I was worried the sangria might be too start with the lemonade, lemons, and limes, but they ended up being the perfect touch to kick up the otherwise mild mango and bold red wine. Going by this recipe alone, I highly recommend picking up a copy of Sangria Recipes by Lisa Shea. I can’t wait to make more of her recipes on the hot summer days in our future! Can you substitute Cointreau for Grand Marnier? I have a lot to learn when it comes to spirits, so when a reader asked me this question, I had to do some research… and was surprised by the answer. While Cointreau and Grand Mariner can both be classified as an orange-flavored liqueur, Cointreau is technically a triple sec. This means that while Grand Mariner is orange in color and made with brandy, Cointreau is colorless and made with neutral spirits. So could you use Grand Marnier in place of Cointreau? Yes, so long as you don’t have an aversion to brandy. 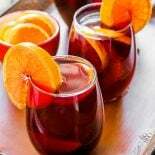 Aside from that, both liqueurs will have a pleasant orange flavor that will do just fine in this sweet red sangria recipe. I couldn’t find the pitcher I used for the photos online, but in my searches, I simply fell in love with this sangria pitcher set. It’s on my Christmas list! If you’d something more simple, this stemless wine glasses can be used for any drink recipe and will look just as classy. 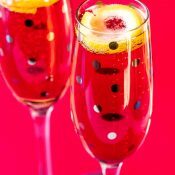 I enjoyed Sangria Recipes by Lisa Shea so much that I also featured another one of her tasty drinks: Blackbeard Berry Sangria. It’s not a tropical sangria recipe, but I promise it’s just as tasty. Be sure to check it out! Place cut mango, orange, lemon, and lime in a large pitcher. Pour in the lemonade and the Rioja and stir well. Taste test the sangria. 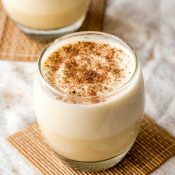 It should be sweet and a bit tart; it will get sweeter as the fruit juice blends into the drink. If you'd like the sangria to be sweeter, add 1 tablespoon of granulated sugar at a time (up to a maximum of 3) until desired sweetness is reached. Let sangria sit in the refrigerator for at least 6 hours or ideally overnight. Serve mango sangria with additional orange slices, if desired. Recipe from Sangria Recipes by Lisa Shea. I could use a glass of this right now. Sangria is technically just juice right? Totally ok to consume at 8:30 am! Sounds like a plan Heather! This looks amazing. A pitcher will be made tonight I think!!! Thanks for sharing! This looks delicious! Love Sangria! I love sangria! I love your addition of the citrus and lemonade! i adore any variation of sangria. can’t wait to try this! This recipe has me dreaming of warm summer days lounging by the pool. The mango and orange in this sangria are a nice change! I love Sangria! 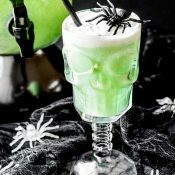 And this looks like the perfect cocktail for neighborhood party! I know, right? Can’t wait for summer! This sounds delicious! 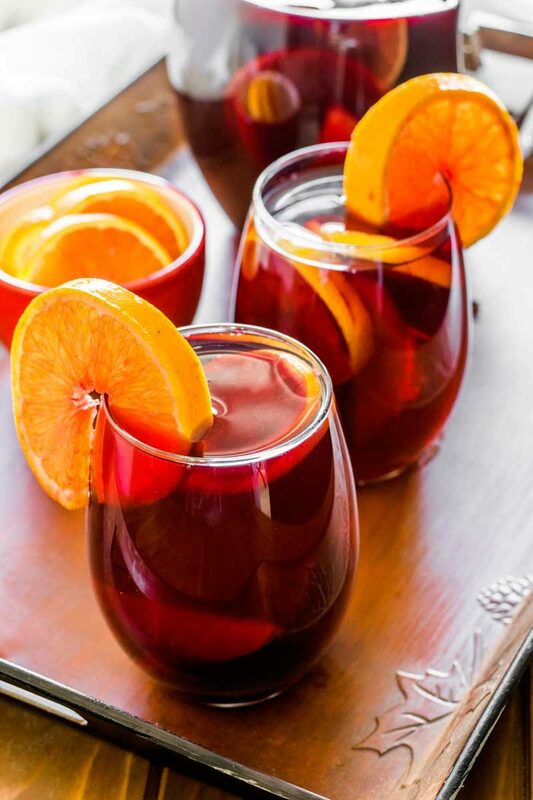 I’ve never made my own sangria, but I think I need to give this recipe a try! Totally worth a try Rachel 🙂 So nice to pick your own flavors! Your husband may think less of me, but I have not had many sangrias. Mainly bottled stuff from the store… I know! 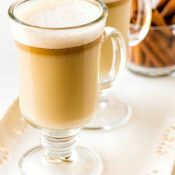 But this has to change because you have made one seriously awesome beverage from that book! All sangria is good in its own way 🙂 Definitely worth making your own, though! Now this I could totally go for this weekend…or any time! Love that colors here! Yay for sangria!! I am having friends over for drinks on the patio tomorrow night and this recipe looks perfect. The cookbook sounds fun! And now you have me craving a nice glass of sangria, lol! Looks delicious! 😀 I try my best! Thanks Bree! Sangria is my number one go to for parties! I will have to try this one! It looks so good! Learning to make Sangria and this looks amazing! When do you add the Bacardi and Grand Marnier? The directions don’t have those ingredients.